The ability to survive desiccation is commonly found in seeds or pollen and it is widespread among bryophytes, but it is rarely present in vegetative tissues. A small group of vascular plants also known as resurrection plants exhibit tolerance to nearly complete desiccation of vegetative tissues. To date more than 300 angiosperm species have been identified that possess this kind of desiccation tolerance. The different problems associated with desiccation require specific mechanisms to be in place. Conservation of structure of membranes and macromolecules is correlated with the synthesis of large amounts of desiccation-induced protective proteins such as late embryogenesis abundant (LEA) proteins, sugars, and reactive oxygen scavengers. The desiccation-induced molecules may have different roles in cellular protection: (1) proteins may conserve structures of macromolecules and membranes, (2) the sugars may be effective in osmotic adjustment and they may stabilize membrane structures and proteins, (3) mechanical damage due to vacuole shrinkage in dehydrating cells is probably avoided by cell wall folding or by replacing the water in vacuoles with non-aqueous substances, and (4) oxidative stress, due to enhanced production of reactive oxygen species (ROS) especially by chloroplasts, is minimized through diverse ROS scavenging molecules. Photochemical activities of resurrection plants are inhibited with loss of water similar to those of non-tolerant plants; however, photosynthesis is rapidly reactivated during rehydration even when plants lost more than 95% water. In this chapter, we describe the molecular and biochemical mechanisms associated with desiccation tolerance as well as morphological and physiological adaptations of resurrection plants. Acquisition of desiccation tolerance requires the coordinated expression of diverse genes, which is achieved through a complex regulatory network. Many of the signalling pathways are mediated via the plant hormone abscisic acid (ABA), a key molecule in the process. Possible evolutionary mechanisms selecting for desiccation-tolerant plants are discussed. 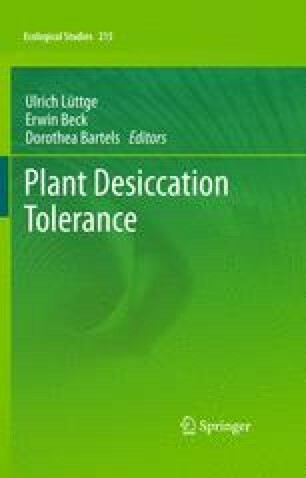 We thank Prof. E. Fischer for advice on the geographical distribution of desiccation-tolerant species and for providing the information contained in Table 16.1. Work in the laboratory of D.B. was supported by grants from the German Research Council, by the European training network ADONIS and by an ERA-PG project. D.B. is a member of the European COST action INPAS (International Network of Plant Abiotic Stress). We thank C. Marikar for help with the manuscript preparation.